A deep trough pushes across W Europe towards the Iberian peninsula, the ridge shifts into Scandinavia. SLGT risk has been issued for Scotland into Northern Ireland with threat for severe winds in excess of 90 km/h. SLGT risks have been issued for NW Italy and SE France with threat for excessive rainfall, locally around 100 mm in 24 hours. 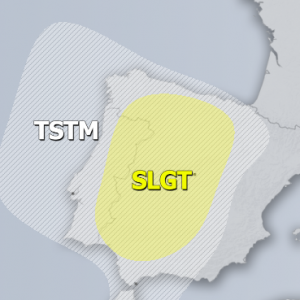 SLGT risk has been issued for N Algeria, N Tunisia into the SW Mediterranean with threat for severe storms capable of producing severe winds, large hail and torrential rainfall. MRGL risk has been issued for eastern half of Germany into W Czech Republic and SW Poland with threat for isolated severe storms, capable of producing marginally large hail and severe winds.